* A farmer favorite for more than 20 years! 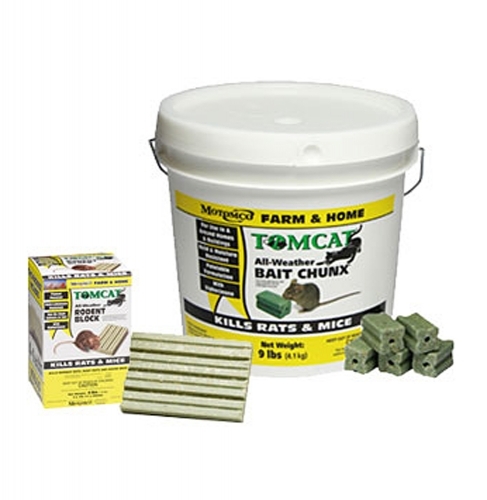 Tomcat rat and mouse bait from Motomco. Multiple-feeding bait for control of Norway rats, roof rats and mice in and around homes, commercial and agricultural buildings. Tom Cat kills rodents in just 4-6 days. Contains 0.005% diphacinone. Manufactured with human food-grade ingredients and enhancers for a bait rodents can’t resist! Made in the USA. Ready-to-use. Fit easily into small openings, burrows or bait stations. Patented multi-edge shape stimulates rodents to gnaw. Low-wax, weatherproof bait is mold and moisture resistant, use indoors and outdoors. 1 oz. Mold and moisture resistant, features patented gnawing edges and can be used indoors or outdoors. Can be broken into 4, 4 oz pieces. Peanut flavored, 1 lb. For Rats – 1-4 pieces per placement, spaced 15-30 ft apart; For Mice – 1-2, 1 oz pieces per placement, spaced 8-12 apart.